I was inspired by quite a few different bullet journal themes I found on Instagram this month. Most of my inspiration came from two specific posts. This one and this one. I loved the colours, the style and it worked well with the stickers I oh-so hoped would arrive on time. Either way, this theme ended out so much better than I expected. I did pretty much copy the quote for my welcome page but full credit goes to @Bullet_Journalish on Instagram who it originally belongs to! For December I changed the monthly theme ever so slightly by giving the days slightly larger boxes because it's a busy month. I don't normally include the blank boxes with no days but I liked the formality of the boxes so I kept it. I really like this and I might keep the stretched out boxes for January too. For the page on the right, I decided to split the page into goals and memories. Instead of marking my achievements separately I decided to just tick off any achieved goals and being a busy and magical month, it made sense to have a space to log some memories as well as in the weekly overviews. This is the first page I introduced poinsettas into the theme and I almost hated it until I coloured the flowers in. I really like it and think that even though it's constrasts the other colours in the theme, it works to keep variety throughout the pages. It has been a breath of fresh air not tracking my steps and my sleep. I started to realise that it wasn't adding any value to myself or my habits and in fact, making a new unhealthy one. It was definitely a good idea to remove that tracker and I enjoy focusing on this one now. I really like this tracker and last month it kept me up to speed with my household responsibilities and made me aware of what I've been falling behind with. I realised that I wasn't keeping up with my skincare routine and I wasn't giving myself time to do non-work related things. I also realised that I've been a sucky social media person so I do want to give myself some time for that because I miss it. My mood tracker is of course, a Christmas tree and I realised that my coding is pretty awful. I also forgot which pens I used for which so I'm going to have to give myself a key to use the key. Oops! I didn't want to go too far off the theme colours so I found it a little difficult putting this together. I hope it works as well as I'd like it to this month. Last year I had a lot of fun colouring my bullet journal advent calendar that I thought this year I'd do a drawing-a-day type advent calendar this time. I really like it already but I do feel like I messed the pictures up already. Nevertheless, it's just something a little different to make counting down the days to Christmas a little more fun. I also decided to do the December Bucket List page from last year again because I managed to do everything on my bucket list (but one) because I'd written it down. There are a couple of things I want to do this year and m bucket list for December isn't complete but these are top of my list for the moment. Another comeback double spread: the nice and naughty list. Last year I had a lot of fun thinking of something nice that happened everyday and just noting down the naughty things when they happened. I made a conscious effort to complete this last year and it just bought that little bit of light and happiness to each day no matter how it went. I'm excited to get on with these pages. 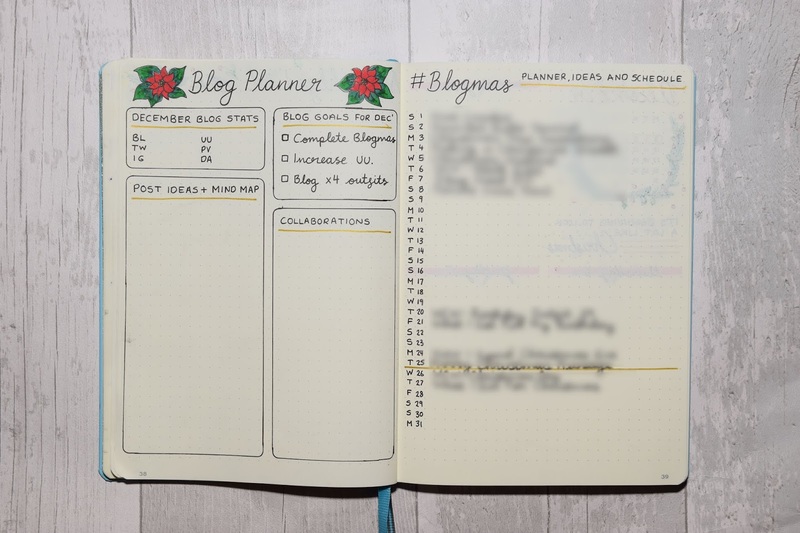 In November, I reintroduced a blog planning page and this month I'm doing it again but with the Blogmas list on the side. I really enjoyed these pages and I used them a lot for brainstorming, but I didn't actually get anything done unfortunately. Either way, writing down the ideas got me thinking about blogging again and encouraged me to do Blogmas again. This time I added a collaborations box as I have a couple I'm working on and merged the brain dump area (which I used for mind mapping) and post ideas area to create one place for all ideas. The Blogmas list returns and I already have a few ideas scheduled into certain places. I'm really looking forward to writing and publishing all my posts this month. Especially after having been a rubbish blogger over the past few months. I want to get my mojo back! These are my weekly overviews. I don't normally show all the details up close but I spent so much time on these and I really wanted to appreciate the time and effort I put into each page. I reverted back to my trusty box theme because it's what I work best with. I barely used last month's pages if I'm totally honest because it just didn't work for me. I think it's because it's easier to do lists with this set up. I kept the theme running throughout but for my weekly overviews I wanted to make sure I included a quote for each week and made them all just slightly different. I also circled important dates and included a little Christmas tree under Christmas Day too. I think the first weekly overview is my favourite. Which weekly overview is your favourite? I'm really excited about Christmas and even more so now I have all my bullet journal pages set up. Last year I used my bullet journal a lot to help keep me organised and I'm sure it'll do it's job again this year. I know I say this about a lot of my previous themes but I genuinely think this is one of my favourites by far. Last month's one was a bit of a flop but I feel like I've redeemed myself with this one. What do you think? Do you prefer this year's December theme or last year's December theme?